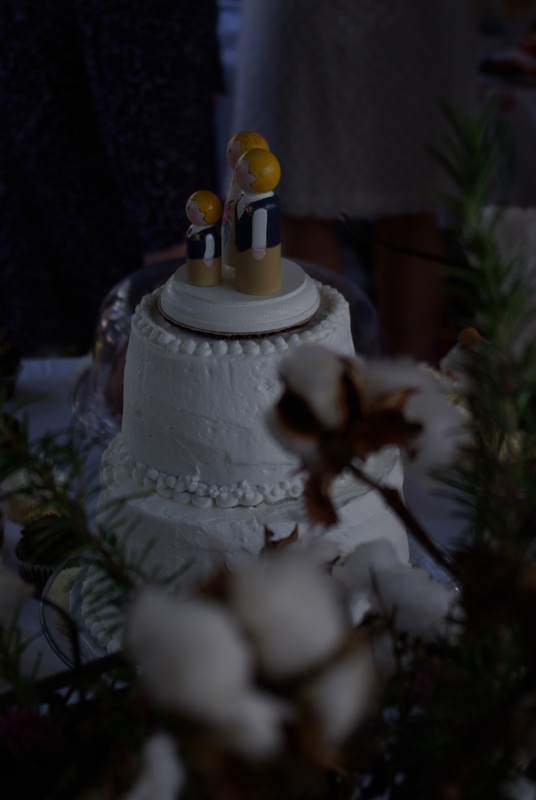 Wanting to include the family in the wedding details, my daughter asked me to create her wedding cake topper to include their small son. 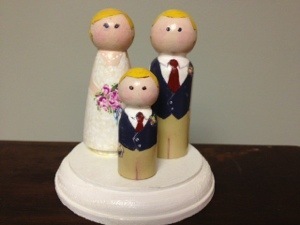 I ordered wooden peg dolls from fair trade Etsy craft vendor, Goose Grease. Many family grouping variations, including pet dolls are available. Orders come with detailed painting instructions. (A nice touch from Goose Grease: when you receive your order, you are invited to enter your completed project into their monthly contest). I ordered four dolls (two adults and two children) at a cost of $18.00. I already had the paints and brushes but needed to purchase a topcoat ($10.00) and base ($0.79) from Michael’s. 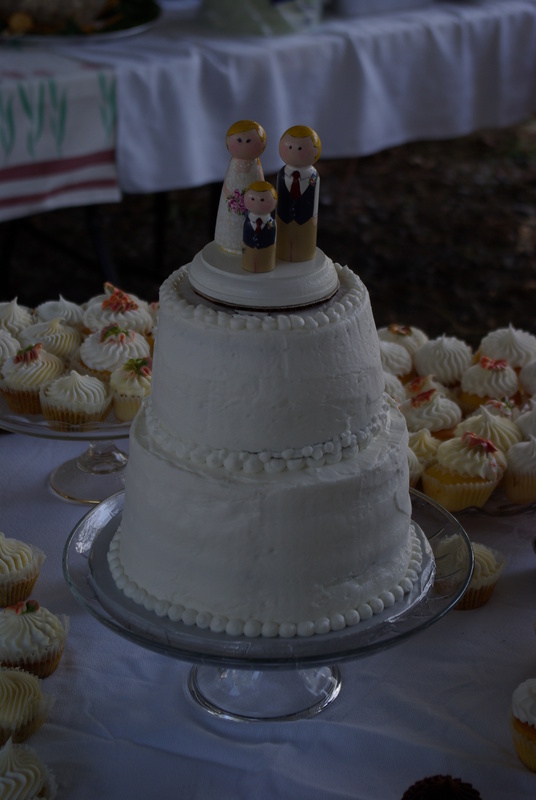 So instead of paying the going price of $100.00+ for a wedding cake topper I was able to create one for our daughter and son-in-law for under $30.00! I was very flattered when the caterer asked me to create a few for her shop, Smithfield Gourmet Bakery & Cafe. Procedure: (Directions do come with the Goose Grease orders) Think in ‘layering’ the paints. For example, clothing is painted first because hair lays ‘on top of’ clothing. Before adding paint, lightly draw body features and clothing design with a pencil. 1. Paint ‘skin tone’ colors on head, neck area, exposed arms and hands. Let dry. 2. In order to achieve a ‘lace’ look, paint first coat of wedding dress a slightly darker creamier white, allow to dry. 3. Apply second coat of bright white paint over dress in a stippling dot fashion. Allow to dry. 4. Use toothpick to paint ‘pearls’ around bride’s nck area. Allow to dry. 5. Paint a bouquet of flowers, greenery and ribbon over top of bride’s hand area. Allow to dry. 6. Outline hairline in paint that is a a slightly darker tone than hair color. Paint hair area. The outline and hair area will blend. Allow to dry. 7. Use a toothpick to paint eyes. Let dry. 8. Add faint paint or pencil lines to mark legs, pockets, etc. Let dry. 2. Paint trousers, up to a waistband. Use tape to mark a straight line. Let dry. 3. Add faint paint or pencil lines to mark legs, pockets, etc. Let dry. 4. Paint shirt areas, dry completly. Add faint paint or pencil lines to denote collar, buttons. Let dry. 5. Paint tie. Let dry. 6. Paint vest or jacket, allow to dry completly. Add faint paint or pencil lines to denote buttons, pockets, etc. 7. Outline hairline in paint that is a a slightly darker tone than hair color. Paint hair area. The outline and hair area will blend. Allow to dry. 9. Use a toothpick to paint eyes. Let dry. 10. Last, paint bouttoniere over vest or jacket. Allow to dry. Note: As an added touch, I painted a gaming toy in our new grandchild’s hand. My daughter found a “crop” of wild bamboo while hiking with her fiancé. 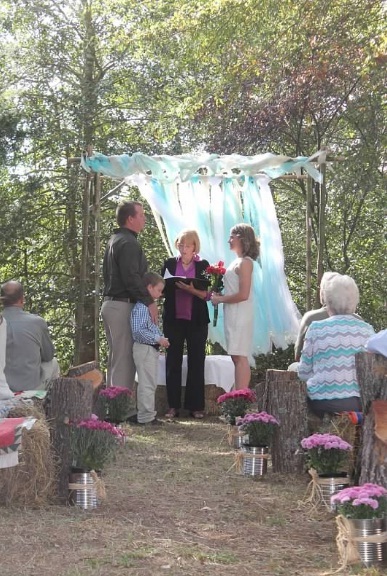 She brought long, thick stalks to her dad to see if he could construct a wedding ceremony arch. After a web search we found a great site, Sunset Bamboo by Island Thatch, Inc. This site sells bamboo poles, thatch, paneling, rugs, slats – you name it. 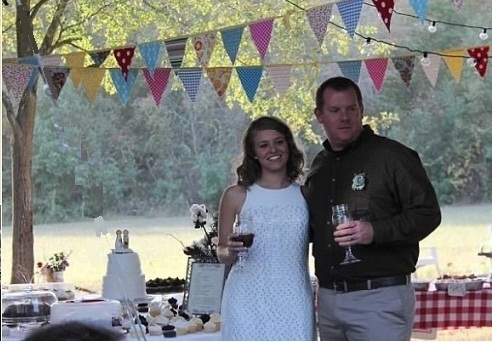 But what is cool is that they also have a Wedding Ceremony Arch DIY/How To page for constructing a ceremony arch. All necessary supplies and tools are listed along with a printable .PDF step-by-step instruction sheet. Once constructed, I draped tulle, fabric and burlap around the poles for colorful décor. 1. Purchase or find wild bamboo poles. They need to be at least 8-10’ in length. 2. Cut or trim bamboo poles into 8’ lengths, high enough for the wedding party to stand under while still having plenty of height left over to drape fabric over the top. If you plan to sink the poles into the ground you’ll need 10’ length poles, so that 2’ of the pole can be buried. 3. Set aside four bamboo poles for the four main vertical columns (A, B and C, D). 4. Set aside four bamboo poles for the four cross beams (E, F, G, and H). The left bamboo may be used for replacement parts or to add even more support. 5. NOTE: Bamboo splits very easily. You may wish to pre-drill wood screw holes to avoid splitting. 6. Columns A, B: Lay two of the vertical columns (A, B) on ground, 6-8’ apart. Lay one overhead cross beam pole (E) across the top of them, about 1’ from the top. Screw in 2 ½” wood screws in your pre-drilled pole. 8. Have a friend hold the columns (A, B) while you adhere a cross beam (G) to columns (C, D) with wood screws. 9. Adhere the last cross beam (H) to columns (A, B) and (C, D). 10. Wrap hemp, twine or rope around the posts and beams. This rope not only serves as a decorative wrap, but adds additional stability. 1. Unwrap bolt and cut tulle into 17’ lengths. Save left over material for later use.2. Cut 2-3” wide strips from the tulle, lengthwise, so that you have 17’ long x 2-3” wide ribbons. Don’t worry about being too evenly cut – I “eye-balled” it. Repeat until all tulle is cut.4. To place on ceremony arch: Fold one length of ribbon in half (making it 8.5’ L). 5. Lay center of fold over top of the back arch cross beam, allowing about 5” to hang over. Then pull the two ribbon lengths through (see photo) the loop. 6. Repeat steps 4-5 until all ribbon has been added to back cross beam. Re-arrange the ribbon to your liking. 7. Repeat steps 1-6 for fabric and burlap ribbons. Add fabric and burlap ribbons in between the tulle ribbons, as desired. 8. Optional: Drape leftover tulle pieces around, over, across the front cross beam for added decoration. When my sister started to restore our grandmother’s 100 year-old home, she kept a few of the vintage windows. My daughter was able to include a little piece of her Great Grandmother Lillian’s memory by using two of these windows as “signs” at her wedding reception. They were a big hit. 1. Research the web for love or wedding quotes and verses for design inspiration. 2. Thoroughly wash old window(s). This is a husband job. 😀 Let dry. 3. Read paint pen directions before use. 4. There are two ways to write on the window pane. If you have a steady hand, write directly on pane – or – write the quote or verse on a piece of paper, then tape the paper under the glass and trace the verse letters. 6. Screw eye hooks to top of window. Tie rope, jute, or add chain to eye hooks for hanging purposes. I added a little raffia for decoration. Gotta’ make one of those pennants I see everywhere on the web! But who has a lot of time? My daughter wanted some for her outdoor vintage-country inspired wedding. I needed them quick and easy. I tried to cut down on the sewing to make this DIY project easier and quicker. There is very little sewing involved – just to attach to the bias tape ribbon. The triangle fabric pieces are cut with pinking shears and left unhemmed. 1. 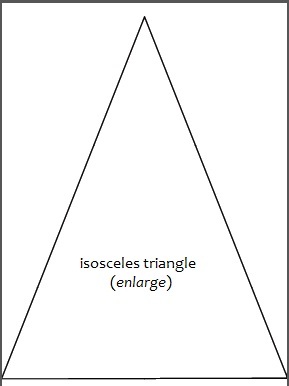 Make a triangle-shaped cardboard pattern (I cut a 7″ 45-45-90 degree triangle pattern from discarded cardboard). 2. Fold fabric in half. Trace outer edge of triangle pattern onto fabric. 3. Cut out traced fabric triangles using pinking shears. 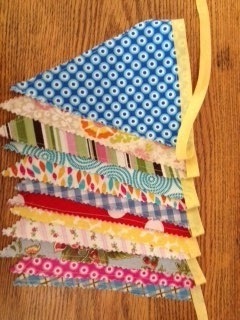 For each banner, I cut out twelve sets of triangles from assorted fabrics (twelve sets, twenty-four pieces). 4. Place one side of the two cut triangle fabric pieces pattern-side down on ironing board. Lay three strips of fusible bonding tape along three edges of fabric. 5. Place the other side of the two cut triangle fabric pieces, pattern-side up, over top the first. Iron the two fabric pieces together. Set aside. Repeat steps 1-5 until all triangles are completed. 6. Cut a fourteen foot length of bias tape. Turn one end of the tape under, hem, sew. Measure and mark twelve inches from end of tape. 7. At the end of the twelve inch mark, open folded bias tape and place triangle edge in middle of inside tape. Sew folded length of bias tape edges together, securing triangle-edged shape inside tape. 8. Measure and mark two inches away from the edge of the just sewn triangle. At this mark, open folded bias tape and place the second triangle inside the tape. Sew folded length of bias tape edges together, securing triangle-edged shape inside tape. 9. Repeat steps 7-8 until all triangle shapes are sewn to banner. 10. After the last triangle-shaped fabric has been sewn to banner, measure and mark fourteen inches. Cut away excess bias tape. Turn under edge of tape, sew together forming a hem. Our daughter wanted to line her long driveway for her outdoor vintage-country wedding with rustic luminaries. Her dad made tin can luminaries using a drill, ice and tin cans. We ate a lot of canned veggies for a while and hiked to the Bay to fill a five gallon bucket with sand. This was a VERY EASY and CHEAP DIY project. 1. Use a marker to mark a dotted pattern on the wrapper of a clean tin can. Simple, basic geometric designs are easier to work with. 2. Fill can with water and place in freezer until frozen. 3. Once water freezes, drill holes into the can on the marked dots. 4. Leave can out so that water thaws. Pour out water, dry off can. 5. Carefully peel,off wrapper. Be careful for the metal around the drilled holes may be slightly sharp. 5. Fill the bottom of the can with 1-2″ of sand. 6. Place a lighted votive inside can, situated in the sand. Do not leave unattended. #zacbrownband #drewholcombandtheneighbors Thanks @lisaduberamsey and Dave!